I carry you against me and you are content pressing into my heartbeat. We breathe in, we breathe out. You mold into me, limbs seemingly discombobulated and I wonder that you could ever find comfort there. I switch you from bare arms to sling to harness- it matters not to you, only to me. As long as you can smell my human sweat, you relax. You are not alone. You sleep beside me and they say you shouldn't, but they don't know how my breath rises and falls by you, how my body is stilled by your presence and doesn't move until your whimpers gently rouse me. They underestimate the depths that are maternal attunement. You wake in the night that finds you hungry, and always I am there. You are nourished, you are kissed, and you sleep again. 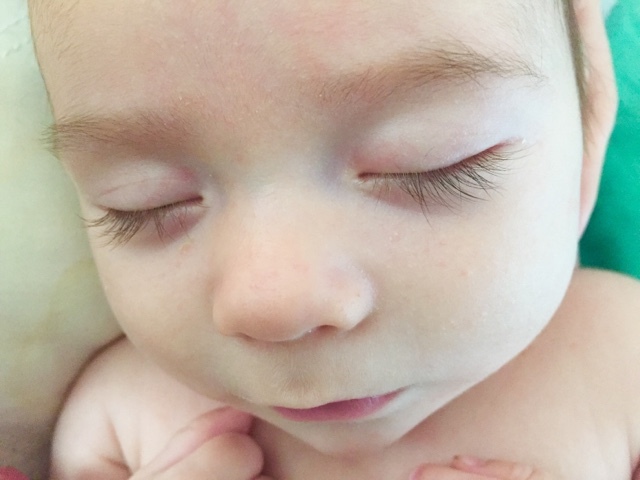 Overnight guests marvel that they never hear you cry, but why would you? You want for nothing in the night. You know that you are not alone. The sun rises and your brothers need me for oatmeal and for snuggles and to watch them ride their bikes. I nurse you at my breast, then I lay you down to stretch my arms for awhile. You wake after mere minutes, you don't want to be alone. So you won't be. I sigh tiredly or chuckle good-naturedly, depending on the day, and I wrap you back on around my flesh. You are not alone, dear one. Your daddy holds you in one arm grown strong with love. Someone walks by and clucks their tongue and calls your spoiled. But we shrug our shoulders and it rolls off our backs because we aren't scared of spoiled. You are 8 weeks old and you know you are not alone. It's been too long, you've woke and been left waiting. Just 5 more minutes, I think, as I chop vegetables and scrape them in the pot. You wail, red-faced, with your bottom lip out. You are alone, and you hate it. Ssshhh, I whisper, hands coming under your back to scoop you up. Ssshhh, my darling. You're not alone. I'm here. You sit in your carseat and you wail. My heart churns and it burns. I talk to you, fake cheerful and loud, hoping that to hear my voice matters somehow. Hoping that it reminds you you aren't alone. But you won't be comforted until I stop the car and press you to my chest. You hear my heartbeat and you are stilled. I know what it's like, my little one. I've spent most of my adult life feeling lonely for one reason or another. It plagues us, us homosapiens. We reach out, we reach near, but it is so rarely enough; not until we cry, not until we confess our need in all our helplessness do those around us understand. For I am just like you, my baby. I long to be known and heard. I long to be pressed tight and squeezed and to be looked at adoringly, even in my filth. I know the Holy Spirit stays with me. I know it but sometimes I need a God with skin on. I need Him to take on hands to feed me, arms to comfort me, lips to teach me. And He knows. Not condescendingly, but experientially. He too was a human dependent, a human in need of others. He knows I wasn't made to be alone, for I've been made in His very image. So let us raise our voices, let us cry out, let us be as babes and not fear dependence on the other. Let us lay our vulnerabilities low and fight for connectedness. For our God made Himself man, and we were not meant to be alone. When I first stepped foot onto the high wire of motherhood, sweeping my arms around a chubby baby with almond eyes and chocolate skin, I knew I would need you. I knew you would have to teach me the best way to moisturize his skin and style his hair. I knew you would instruct me in forming his racial identity. 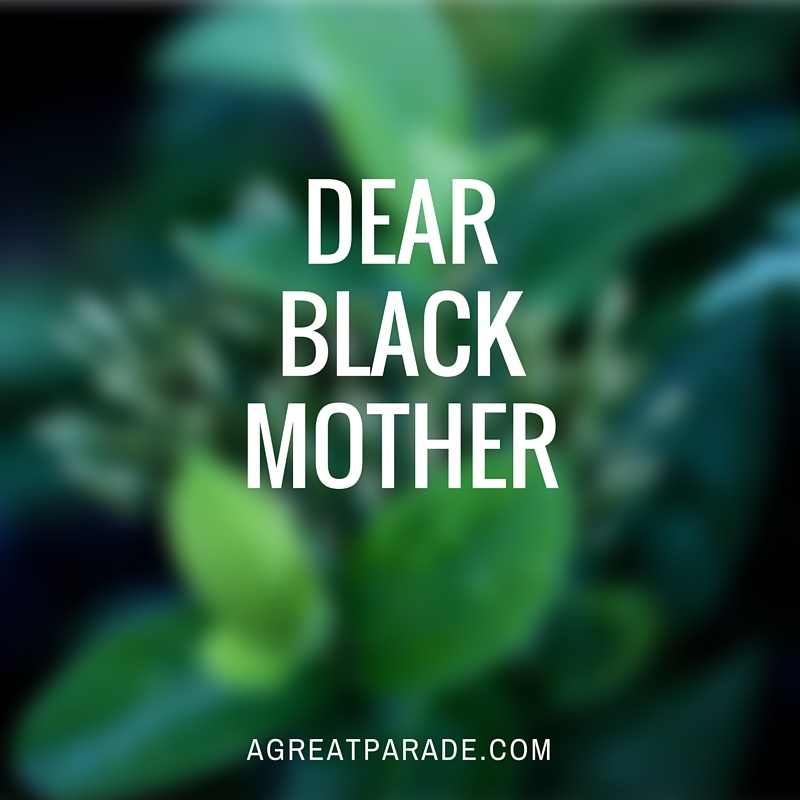 I knew I would need to hear you tell me about what it feels like to be black in America. But this? I didn't know this. Most of us white folks didn't, not before the age of social media and video cameras on smartphones. Now, nearly 6 years into motherhood, I know it all too well. But once I didn't. I didn't know that from the moment the doctor said "it's a boy!" your euphoric cries of joy were laced ever so faintly with fear of the future. I didn't know that when your preschooler threw his flailing body on the tile of the grocery store, tantruming in the way that every child has since the beginning of time, passerbys would be more likely to see him as a troublemaker and you as an unfit parent. I didn't know that when his limbs grew long and his back grew high, the way my son's are doing today, that you began to think about having The Talk. I didn't know your cognitive dissonance: how you wanted to preserve his innocence, wanted to support the many fair and level-headed police in your community, but knowing the consequences of not preparing him for the worst could be fatal. I didn't know that was around the time he was forbidden to play with toy guns outside. I didn't know that you had to sit him down and look at his innocent cheeks, still with a hint of baby fat on them, and tell him exactly what to do anytime he spoke with a police officer. Hands out, stand still, don't move a single muscle, say yes sir. I didn't know that you had to tell him he wouldn't get the benefit of the doubt. I didn't know that when he was 13 you wouldn't let him leave the house with his hood pulled up, even if it was because he was shy, even if it made him feel safer. I didn't know that when he got his license he would be more likely to be pulled over and more than twice as likely to have his car searched as his white peers. I didn't know that when he experimented with marijuana the way so many teens do, he was up to 30% more likely to be arrested for possession than his peers of other ethnicities. I didn't know that when he was shot people would use that arrest record to prove that he deserved to die. 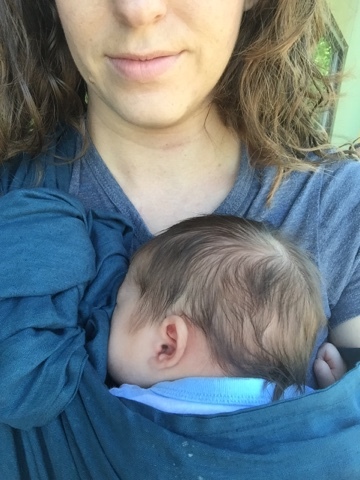 Six years ago I didn't know that this was your reality, the background hum against which you lived out your motherhood, so steady and so constant that most days you didn't think twice about it. It was just always there. Just as it had been for your mother. And your grandmother? Well she couldn't even use the same bathroom as mine. It was not so long ago and roots, they go deep but we want to lop the top off the weeds and declare the soil new. I didn't know, but now I do. And now a few more people will know too. 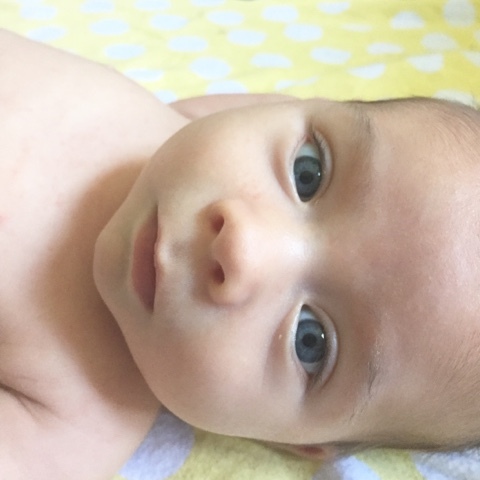 After I hacked out Taavi's birth story and linked to Moses' birth story that I wrote in December, I realized that this blog would simply not be complete without some homage to Alyosha's adoption story too. So buckle up my peeps because here it is, the tale of my first baby coming into my little world. The story begins long before our son is born. In 2006, after a few short months of marriage, Eric was devouring The Brothers Karamazov by Fyodor Dosteovsky. The main character, as you may know, is named Alyosha. Pure of heart, a friend of children, sinners, and atheists, a "defender of mankind", Alyosha is the Christ figure of the novel. His is a beautiful character, one that you can't help but fall in love with. One night Eric has the most intense dream of his life and wakes up shaking and drenched in sweat. In the dream he hears the voice of God speaking to him: "you are my little Alyosha". The next day, Eric tells me about the dream. He pauses, glancing at me sideways, shyly. "If we have a son one day, what would you think of naming him Alyosha? I think I'd like to. If God as a Father speaks that over me, I would like to speak it over my son." I move my pancake around the plate with my fork. "We'll see." On our 3 year anniversary, coming home to the island of Java after a celebratory vacation in Bali, we decide to adopt. We put off having children throughout our missionary training school, wanting to wait until we had put down roots in Indonesia to bring a baby into the family. And finally, after 4 months in country, we have begun the conversation. Eric installing something necessary for gas safety before the American social worker came from Germany to do our home study. (Ex pat adoption is no walk in the park.) 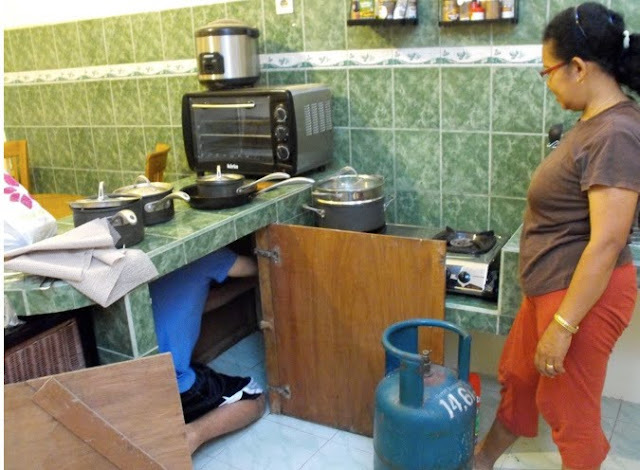 That's our Indonesian house helper looking on and yes, that's our entire kitchen (the sink's behind her). 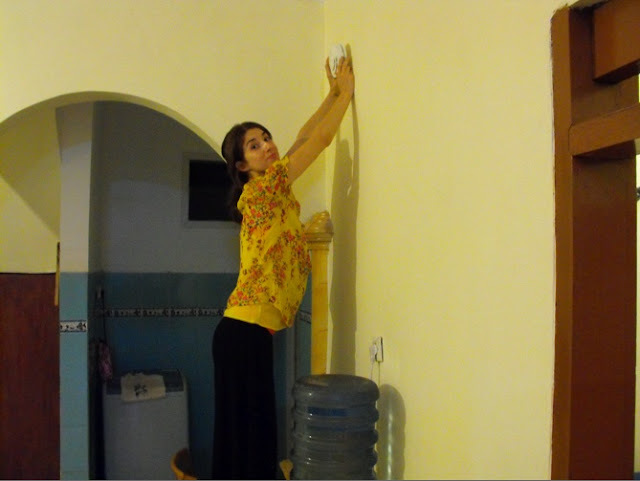 Ceremoniously installing a smoke detector- a requirement for a U.S. home study and an anomaly in Indonesian homes. Beside me is our drinking water that we replaced every few days. Behind me is our washing machine (we line dried everything) and the door to the bathroom (i.e. squatty potty and bucket bath area). 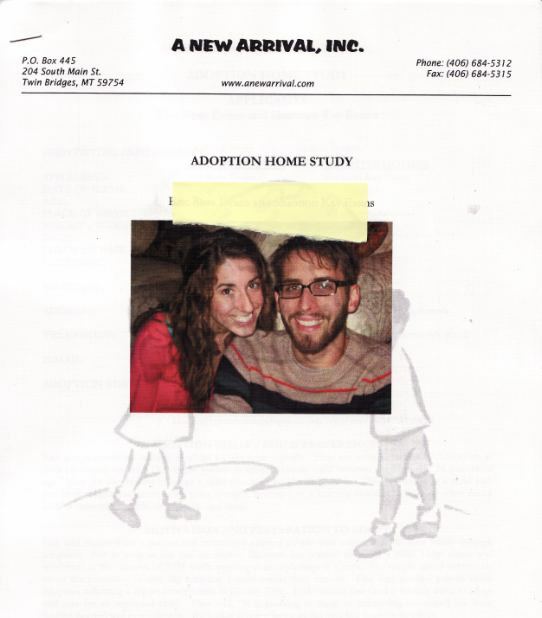 A copy of our finalized home study, though I can't remember why our names are covered in this photo. In less than a year we have our home study and immigration paperwork complete. We mail it in to our adoption agency while on a short visit home to Dallas, so excited for the next step: being matched with a child, a darling little girl aged 0-2 whom we would name Evangeline. Instead, I sit in the kitchen of my in-laws house and read a very different email to Eric out loud. 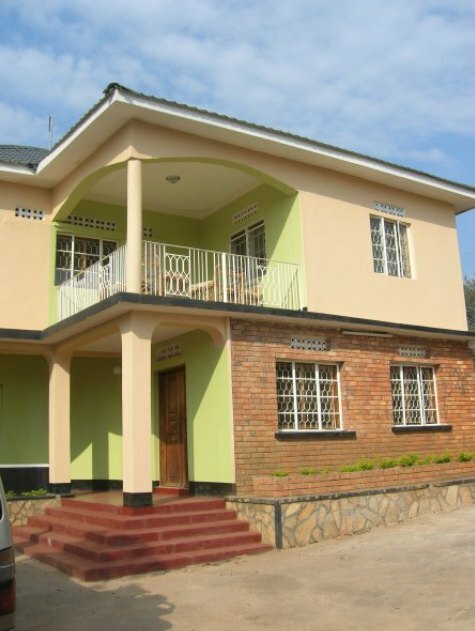 The agency says they have received our paperwork but there are currently no girls in the orphanage who have not already been matched with a family. Our options are to wait for a girl, for them to look at orphanages outside of the one they work closely with, or to consider a boy. We discuss it and I write back immediately, telling our case worker that we'll need a day or two to think about it. It was supposed to be a girl. All year we've been talking about a girl. People have even begun giving us pink gifts! But I don't want to wait. Is it wrong to ask them to look at other orphanages? They said they could. But is it wrong when there's a boy right there, waiting? In the meantime we take the train with Eric's family to a used bookstore. We walk through the double doors and I thank God one more time for air conditioning. I make a beeline for the parenting section, eager to feast on the stacks and stacks of resources usually denied to me in my native tongue. 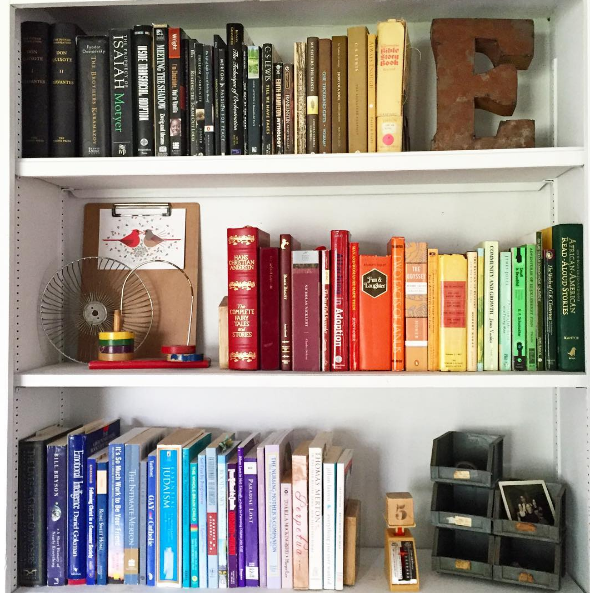 To my delight, there is one tiny shelf specifically devoted to adoption. Hungrily, I scan the spines until I see one that makes my heartbeat stop. With eyes the size of saucers, I carry the book like our priest carries the Bible during Mass: gingerly, reverently. I find my husband, the love of my life, and wordlessly, I hold the precious manuscript up before his face. His eyes grow just like mine have. He laughs. I laugh. We hug each other tight. Four months later our plane touches down on Ugandan soil. We've come from Indonesia and we roll suitcases with most of our worldly possessions inside. We won't go back after this. 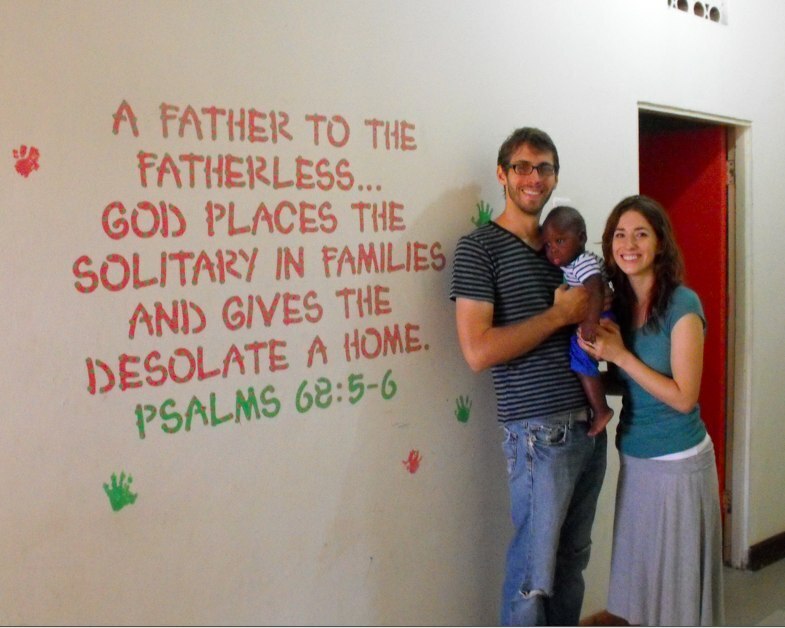 We, a new family of three, will move back to the States to begin life together. Eric is going back to finish his undergraduate degree and then get a Master's. A new chapter of life is unfolding for all of us and we feel the weight of it hanging heavy. Goodbye to our best friends and beloved teammates. Goodbye to the dream we thought we had. Hello to our son. Hello to a future that is still a blur. The car is stuffy but the views are splendid. Our driver points out sights now and then and bears with our ignorant questions. I comment on how it reminds me of Kenya and he is clearly miffed. They are very different, he maintains. Eric squeezes my hand and we share nervous smiles. 45 minutes until we meet our baby. 30 minutes. 15 minutes. We're here. As if in a dream, we enter the modest house. Sounds of life pulse everywhere: toddlers eating porridge, nannies conversing in beautiful tongue, an infant protesting a diaper change. They begin to lead us into the baby room, the room that holds our future, and I pull back Eric's t-shirt to stop him. Give someone your phone to record it, I whisper-beg. He complies, she presses record, and we pass the threshold of the door. We pass into new life and a Something that we could never have envisioned. I become Mother and he becomes Father and this orphan baby sucking formula in a bouncer, he becomes Son. We bend down low before him. Hello Alyosha, I whisper. I'm Mama.